← Charles J. Mode, Ph.D.
BROWNSVILLE, TX, February 28, 2013, Michael A. Lytle, CMI-III, FACFE, Forensic Investigation Program Coordinator for the Criminal Justice Department of The University of Texas at Brownsville, has been recognized by Elite American Educators for dedication, achievements, and leadership in forensic science. Lauded by his professional peers as an expert in counter-terrorism and forensic science, Professor Lytle shines as a luminary in his field, bringing forth more than 36 years of experience to his teaching role, wherein he is in charge of educating others on the subjects. He also consults with government organizations, and advising on law enforcement command, control, communications and intelligence programs. Professor Lytle is as a crime scene investigator, forensic examiner and renowned forensic educator; he founded a successful forensic science program at Marymount University. The LTC Michael A. Lytle ’77 Academic Prize in Forensic Science was named after him at Sam Houston State University. Professor Lytle attended Indiana University where he earned a Bachelor of Arts in Forensic Studies and Political Science. He also earned a Master of Education in Curriculum with a concentration in College Teaching at Texas A&M University. He is currently pursuing a Ph.D. in Higher Education Administration and Public Management from the prestigious institute of higher education. He completed his intermediate and senior-level professional military education at the U.S. Army Command & General Staff College and the National Defense University. He also holds accreditation as a Licensed TCLEOSE Instructor, a Certified Medical Investigator III from the American College of Forensic Examiners, and a Certified Forensic Examiner and Certified Trainer. He is also a Licensed Police Instructor through the State of Texas, and holds an academic Graduate Certificate in Forensic Nursing from the University of California, Riverside. Additionally, he holds an academic Graduate Certificate in Law Enforcement & Police Science through the Institute of Contemporary Corrections & Behavioral Science at Sam Houston State University. 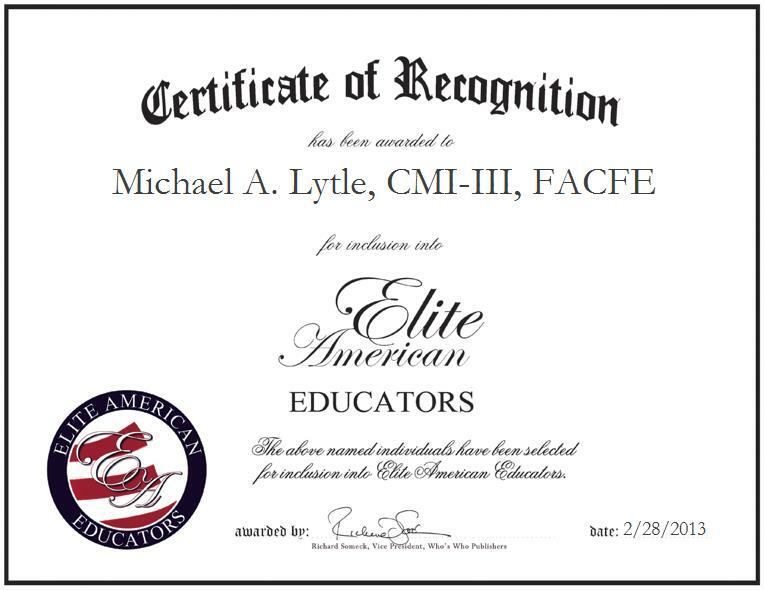 Michael A. Lytle, CMI-III, FACFE was originally selected for inclusion in EliteAMERICAN Educators in February 2013. We are proud to be featuring Professor Lytle again in EliteAMERICAN Educators for 2015.